We had a solid Thanksgiving in Vermont with Kristi’s family. Lots of eating, a couple gobbler sandwiches, and the time tested tradition of me bringing an odd food item to a family gathering, putting it out on the table, and hiding. To backtrack slightly, Kristi and I visited Vermont a week and a half before Thanksgiving on the first weekend of deer season. 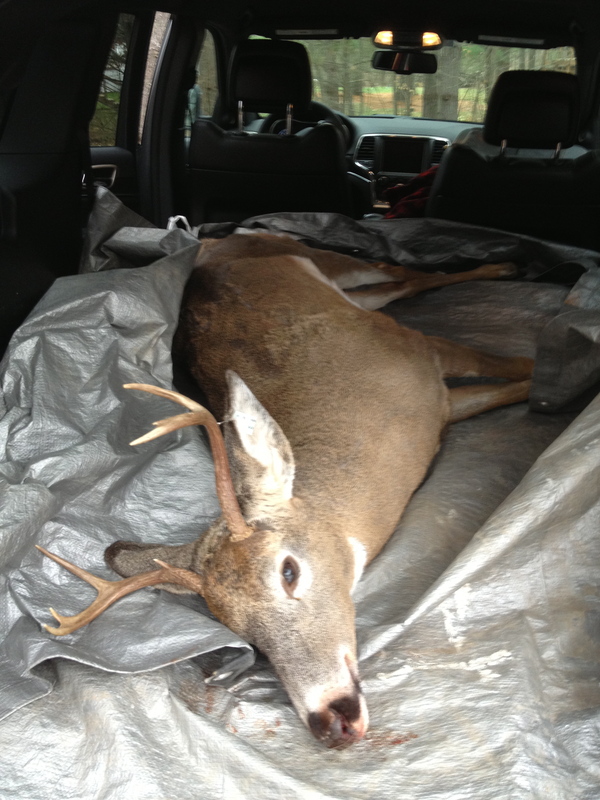 That Saturday morning, we got the call from Kristi’s father, Ken, that he had taken a four point buck from his stand. And he saved me the heart and liver when he field dressed it. As Janet would say, that’s exciting. After helping Ken hang the deer in the barn, I wrapped the heart up tight and left it in Ken and Carolyn’s freezer to cook with Ken when I returned for Thanksgiving. The gigantic liver stayed in its’ shopping bag and went into a cooler for the ride back to Boston. 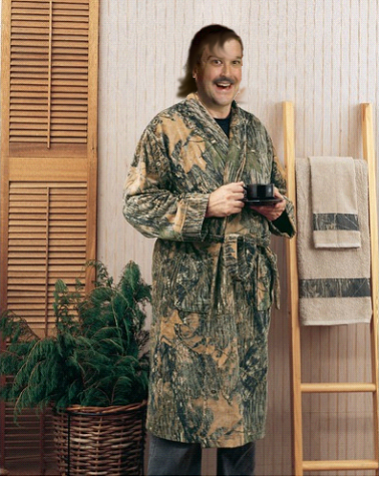 This seems like an opportunity to share a coworker’s photoshop of one of the bathrobes in the Wayfair catalog in honor of my recent ridiculous hockey hair. Back in my home kitchen, I went through my usual hyping up session to prepare myself to deal with the gigantic liver in a Greg’s Meat Market bag. Mostly the “hyping up” amounted to watching football and avoiding looking in the bottom drawer of the fridge. 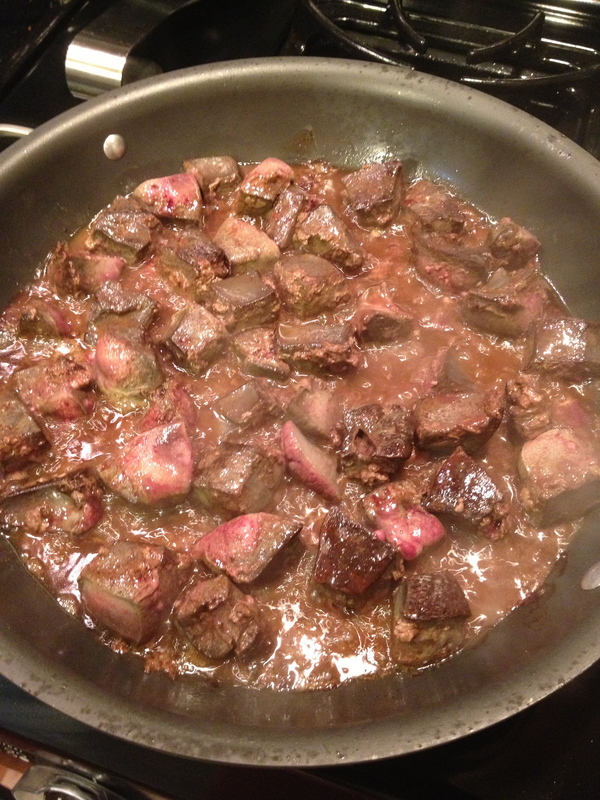 Eventually I decided to get it over with and clean/package the liver for cooking the following weekend. After a quick rinse in the sink to remove some grass and pine needles from field dressing (one of those “sh*t just got real” moments), I laid it out on the cutting board. When I placed the liver on the scale, it came in at a whopping 3.5 pounds. That’s a lot of liver! I knew that I didn’t have enough friends or family willing to eat this in one sitting so I would need to cook it in at least two separate meals. 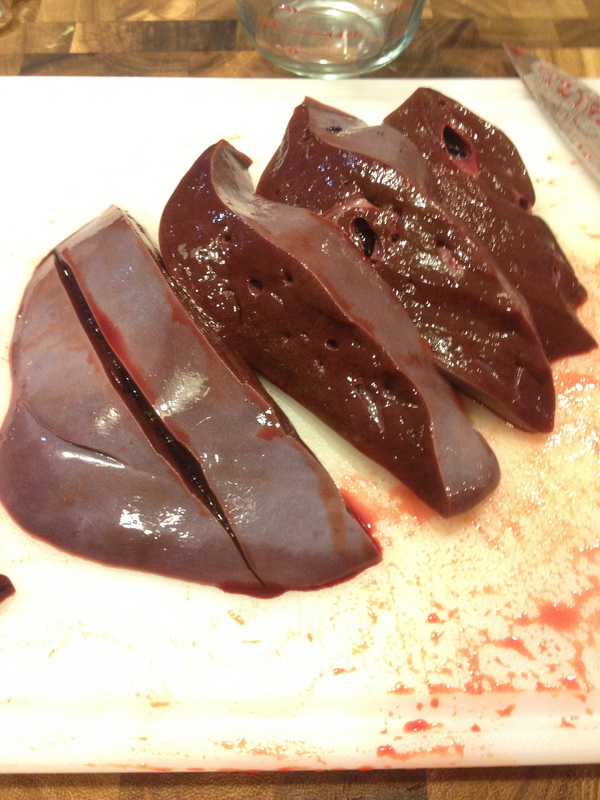 Which also gave me the opportunity to try a couple different preparations of the liver. 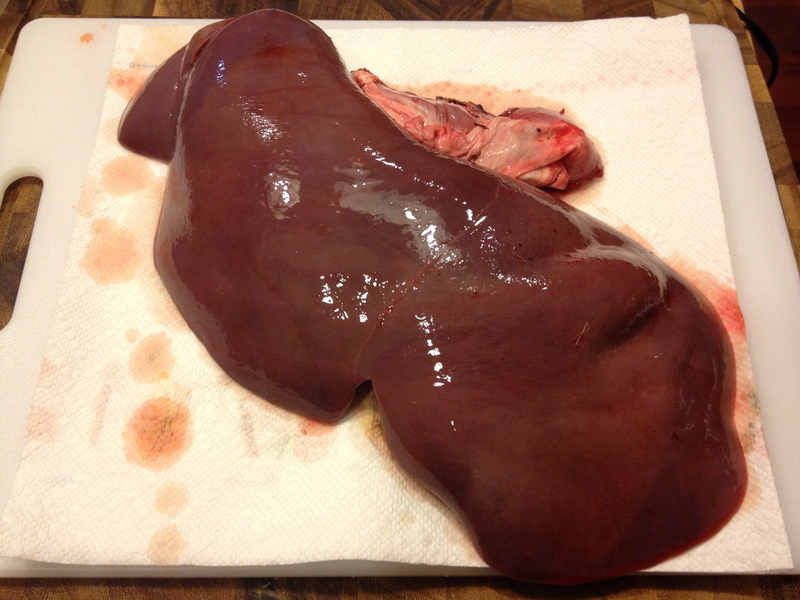 I removed the muscle that attached the liver to the body and cleaned out some of the area where the blood flowed in primarily before cutting the liver into two evenly-sized pieces. Given that this thing was a day old, smelled extremely fresh, and was as organic and local as a food can be, I decided to (quietly, when Kristi wasn’t looking) be a bit adventurous with the meat. 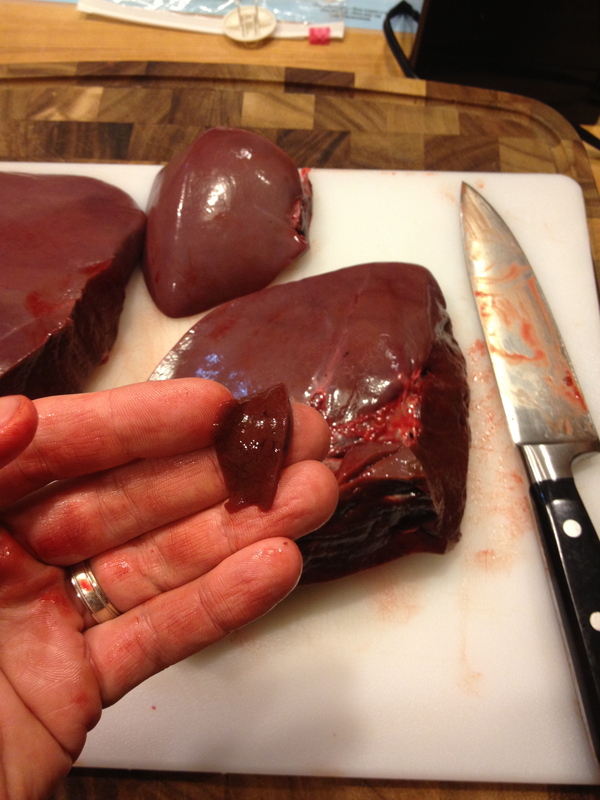 Given how strong cooked liver tastes, I think everybody (read: anybody crazy enough to try it) would be stunned by the taste of raw, fresh, natural liver. It had very little flavor aside from a milky, nutty taste, almost like almond milk. The texture was relatively enjoyable as well. Very surprising. The two halves went into separate vacuum sealed bags and into the freezer. The freezer was necessary for keeping the liver tasty for the week lag before I was planning to cook it, but also helpful since, when thawed, the liver would purge a good amount of blood. With Thanksgiving coming up and the opportunity to share the liver with Kristi’s family, aunts, uncles, and cousins, I decided to use the liver for something easy to transport and share. I also wanted to dial back the overpowering liver taste as much as possible, so I elected to make a liver mousse (or pate). I’ve made chicken liver mousse before with shallots and brandy, but I decided to make this one a bit differently. First step was thawing half of the liver and soaking it in a salted water bath. The salt makes the exterior look a lot less fresh and appetizing. Right? The salt water is what makes this look less appetizing. Right???? After an hour in the cold salted water bath, a decent amount of blood had been purged from the liver and I moved it to the cutting board to slice thickly in preparation for cubing it. 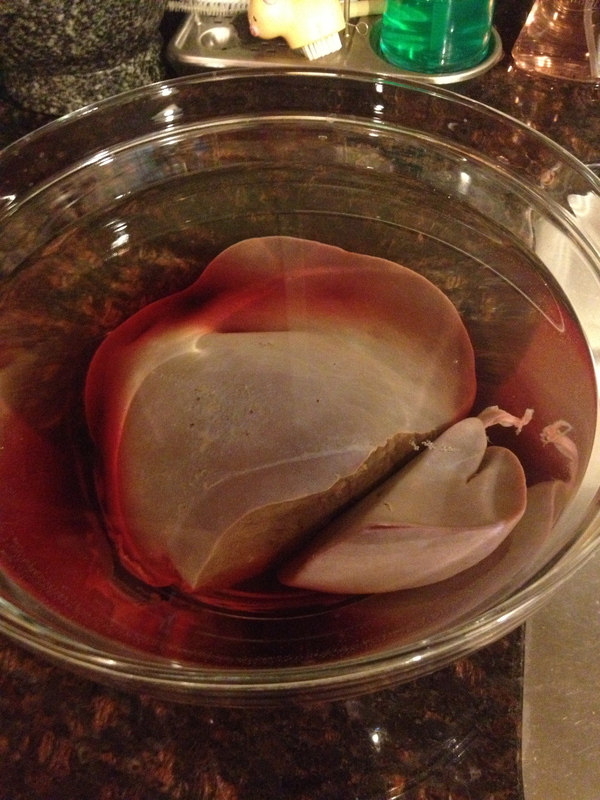 Once cubed, the liver went onto some paper towel to drain off a bit more blood and I started the extremely tedious process of peeling and slicing a half pound of shallots. The shallots would probably be the nicer thing to show here, but also boring. 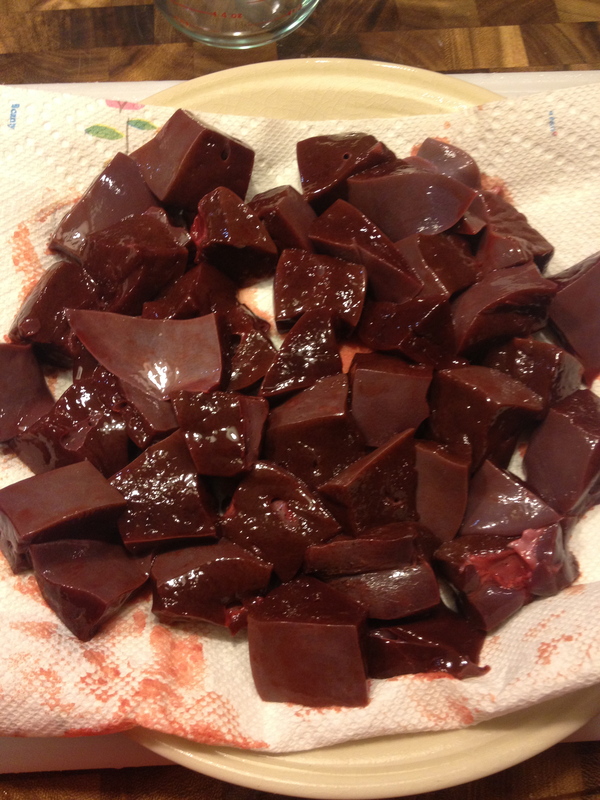 So lets look at a pile of cubed game liver on a paper towel. After the liver had drained on the paper towels for 10-15 minutes, I patted it dry to remove the last of the excess liquid and heated a large pan over medium-high heat. 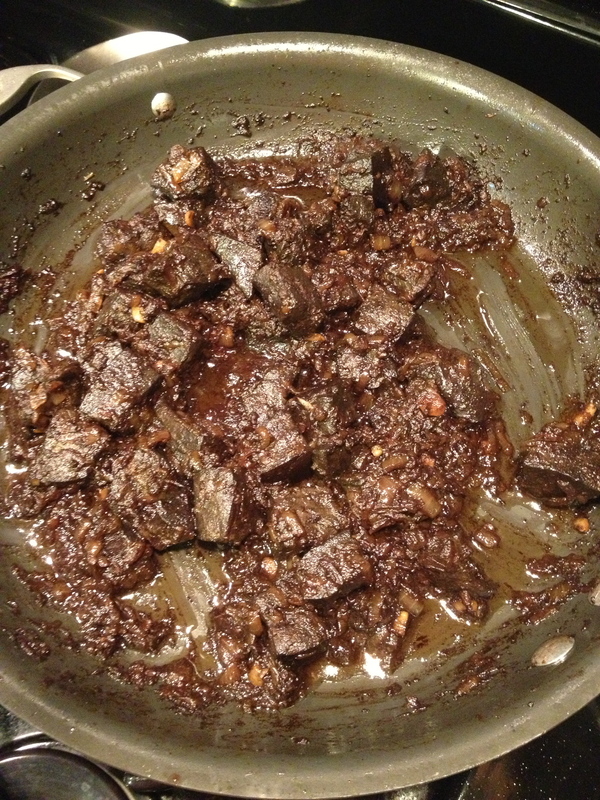 Once up to heat, I put a couple tablespoons of safflower oil in the pan, seasoned the liver with salt and pepper, and browned the cubes on all sides. 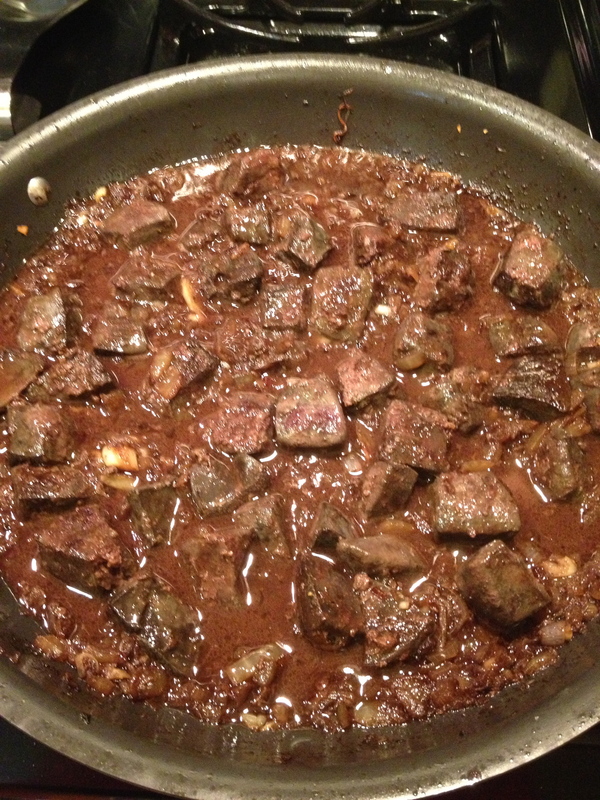 Once well browned, and looking like dark brown iced cubes, the liver was removed from the pan and reserved on a plate. 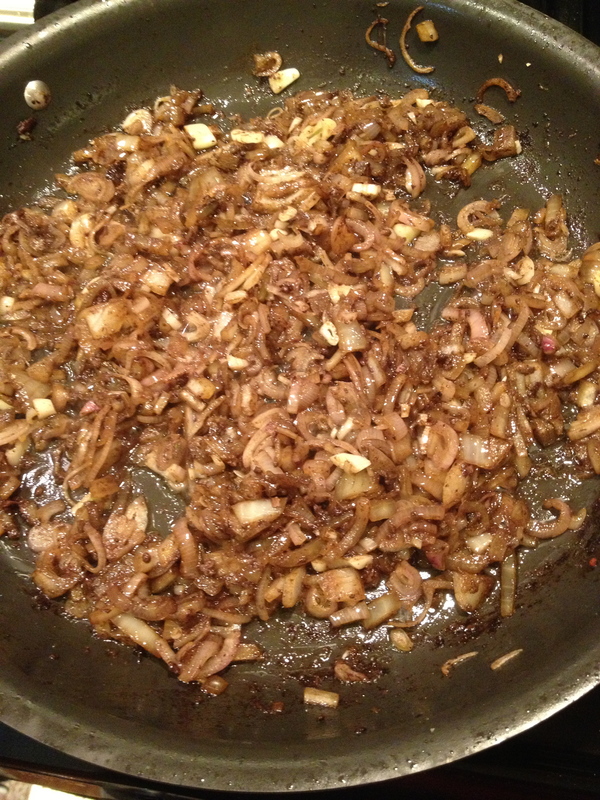 Then the shallots headed into the pan along with a couple cloves of chopped garlic and tablespoon of bacon grease. Once the shallots & garlic were soft and fragrant, the liver went pack into the pan along with a half cup of red wine and a half cup of port. Once the wine was added, I covered the pan (slightly askew) and let the wine reduce by about 3/4 over medium-low heat. It took about 15 minutes to get to this. I prolly reduced it too much but the nice thing about liver mousse is you can just add that moisture back in the blending process. You’ll see. Aren’t you excited to see? I moved the pan off the heat and let it cool for 5-10 minutes. 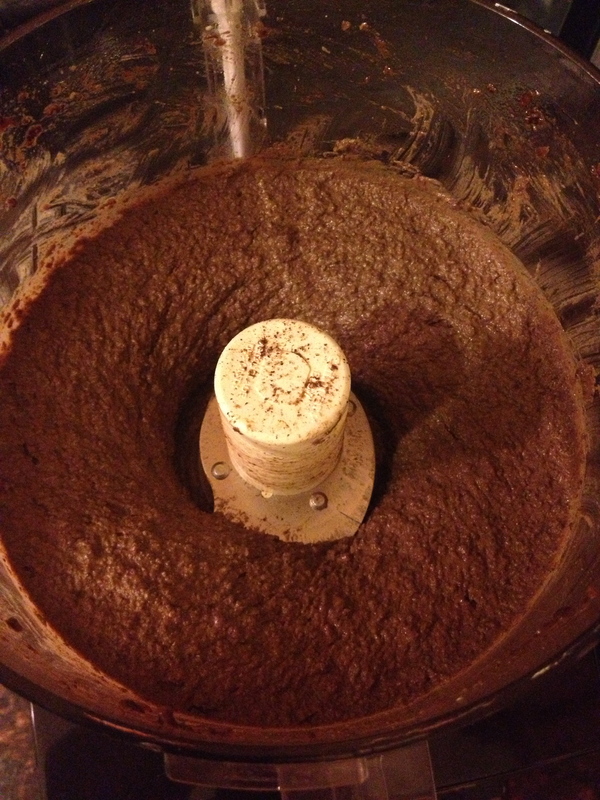 The goal was to have it stillwarm enough to blend smoothly but not so hot that it melted my Cuisinart. Once cool (to my eye), I scraped all contents of the pan into my food processor along with a couple tablespoons of cold butter and pulsed it a few times to start breaking down the contents. Then, I left it on a steady run while slowly pouring in half and half until the consistency looked about how I was hoping. Quick side note on the butter addition. I’d always assumed that liver mousse was primarily made of just liver, but there is such a wide divide between the strong flavor of straight liver and the mild flavor of a pate. A few food shows cleared this up for me in the past year where I’ve seen chefs use butter, sometime in a 1:1 ratio, to smooth the texture of liver mousse. I wasn’t going to go close to that ratio, but it was definitely a change from last time around. This note came out far less interesting than I expected when I started writing it. Back to that bowl of brown. Once the consistency looked right to me, I added a splash of balsamic vinegar on the recommendation of the internets and ran the food processor for another 30-45 seconds attempting to get the texture as smooth and uniform as possible. At this point I had the option to press it through a mesh sieve to make the final product even more smooth, but this created a painful cleanup situation last time I attempted so I passed. Just didn’t seem worth it; if you are willing to eat liver you won’t mind a little texture in your pate. So, it headed straight from the bowl to the dish that I planned to refrigerate and let the pate set in. This pyrex was a recent addition that seemed destined to eventually house either a pate or head cheese. This is about 8″ long by 4″ wide and only an inch or two deep. That’s organ meat container dimensions! After a couple hours in the fridge, it was ready to sample. 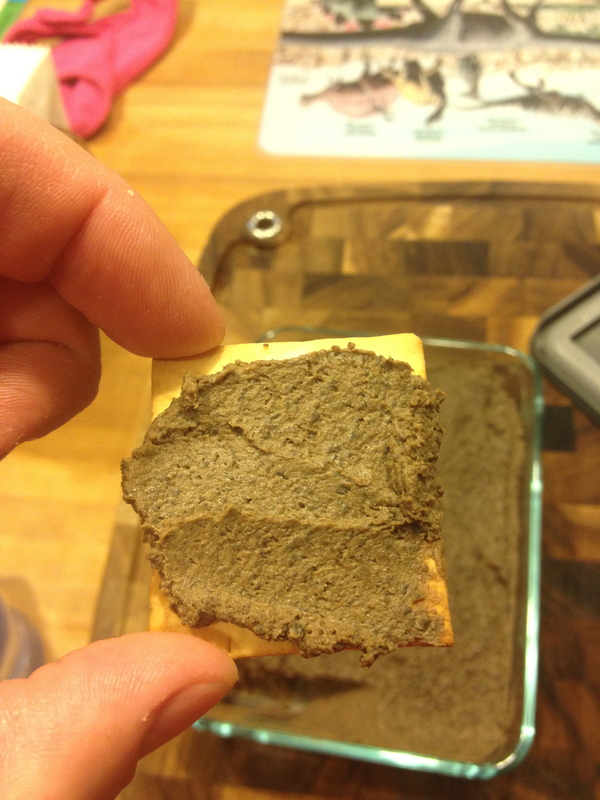 Unlike a lot of other things I make, liver mousse is only sampled while cooking in tiny tastes to make sure the flavor is right, since hot liver pudding is not that enjoyable. But cold, its like the boursin of Mt. Olympus, kept from the masses because they couldn’t handle its deliciousness. This one came out far better than the chicken liver mousse, likely due to some of the extra ingredients this time around. The flavor was mild and slightly sweet from the shallots and possibly the liver itself. 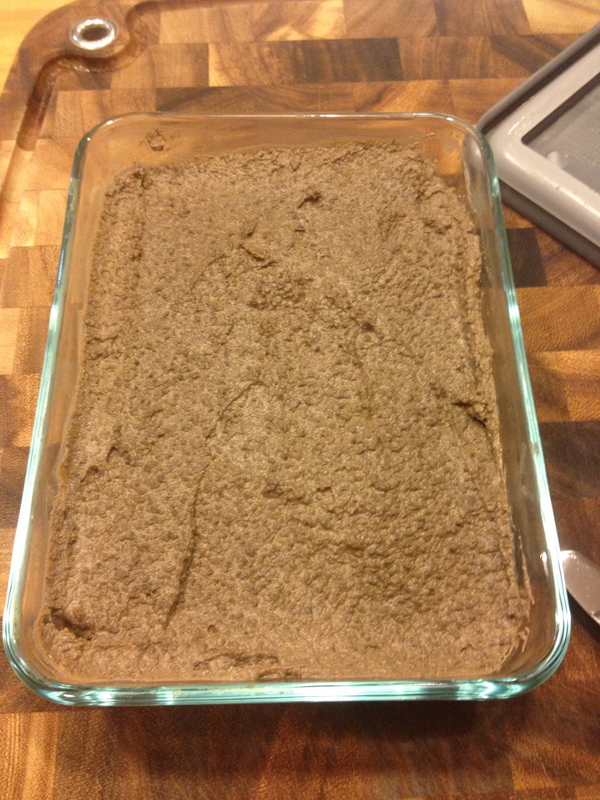 The texture was smooth and not grainy, despite not pressing the pate through a mesh sieve prior to letting it set. I attribute both the texture and mild flavor to using more half and half and a little cold butter when blending this time around. I’m not sure what the balsamic added since it wasn’t a notable flavor, but it might have been what brought out the wine and port flavors. Overall, very tasty, and I ate a ton of it over the following four days. The biggest surprise was that I wasn’t the only one eating my offal product for once. It went out as an app before thanksgiving and quite a bit of the family partook, including the hunter himself. Most of the feedback was how mild the liver flavor was. Kristi even ate some, meaning she’s rapidly on her way to full scale Ryan tastebuds. She’ll be eating liverwurst subs with extra mayo in no time. This entry was posted in Weird Crap I Cook and tagged deer, game, how to, how to cook, how to make, liver, meat, mousse, pate, recipe, venison, vermont by peterryan02. Bookmark the permalink. Hi Pete, love your blog! I eat all kinds of critters and offal as I travewl to some wierd spots. I’m back with travellers diarrhea from something I had in Seoul, Korea, but loved the mystery meat and soup! /in Naples, Fl, my fave is Inca’s Kitchen-the best Peruvian cuisine you’ll ever have at reasonable prices. Buzz’s Lightouse is a funky dive on the water great for shmoozing and grouper sandwiches. USS Nemo has great fish, with miso sauce, Bha Bha has very good Persian food, Dolce & Salato is a very good spot for fresh lunch sandwiches and meet the Italian community, some nights there’s opera and over 20 foods buffet selection. Weekend Willie’s is my sports bar with very good food. Blue Windows Bistro or Escargot 41 are great French spots. La Trattoria Casa Nanpoli has Cuban and Italian in Ft myers Lee Roy Selmon’s has inexpensive luscious Southenr food. For an upgrade go to Bites i the lobby of the Ritz Carleton on the beach-taste tapas and stay for hours with great music, esp a man w/guitar and Mexican woman singing. Black eyed pig or Brown bag have good BBQ. Hope that[‘s a good start!